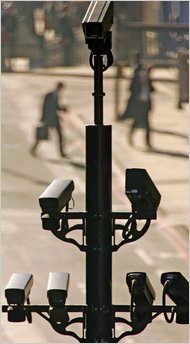 The new government plans to curb the system of tens of thousands of surveillance cameras posted in London, citing them as intrusive. Editor: Verrrry interesting. Britain wants to dismantle its surveillance camera systems while the City of San Diego wants to install them, including a camera on the OB Pier. LONDON — Defying those who said it might be paralyzed by internal divisions, Britain’s new coalition government of Conservatives and Liberal Democrats on Wednesday unveiled the most ambitious plan in decades for upending the highly centralized and often intrusive way the country is governed. The plan, as laid out by the deputy prime minister, Nick Clegg, would roll back a proliferation of “nanny state” laws, non-elected administrative bodies and surveillance systems — many of them a product of Labour’s 13 years in power — that critics say have curbed individual freedoms and enlarged state powers to a degree unrivaled by most other democratic societies. Vowing that the coalition would end “the culture of spying on its citizens,” Mr. Clegg said it would “tear through the statute book,” scrapping a nationwide system of identity cards on which the Labour government spent huge sums, and abandoning a new generation of “biometric” passports that would hold a vastly expanded archive of personal data. In addition, he said, there would be new restrictions on the government’s right to intercept and hold personal Internet and e-mail traffic and to store DNA data from people not convicted of any crime. Mr. Clegg said the changes would also place new curbs on tens of thousands of closed-circuit television cameras in public places — a field in which, critics say, Britain is a world leader. Those critics, have complained that despite the cameras — which the police use to trace the movement of suspects and victims through shopping centers, city streets, hospitals, gas stations and other public places — there has been little impact on crime rates over the years. “It is outrageous that decent, law-abiding citizens get treated as if they have got something to hide,” Mr. Clegg said. What I find interesting is that the “conservatives” are going to remove them, and they have all been placed during the “labor” party’s time in power. Yeah, thanks a lot ol’ Labor Party – good job at keepin an eye out for Big Brother! Perhaps Homeland Insecurity can purchase these British cameras for a fraction of the cost of purchasing new ones from China….whatta ya think?